Torture museum is a one of a kind attraction and as the name suggests it has exhibitions related to torture. The museum displays the role of torture in the society and how its advent affected the time periods.Visit the destination and experience the spine chilly experience that the place has to offer. From the medieval to the dark ages the place has a huge collection of torture instruments that will leave you astounded. Adult ticket costs 7 Euros. Children ticket costs 4 Euros. Take a tram or bus from Amsterdam, Muntplein. How popular is Torture Museum? People normally also visit Rembrandtplein while planning their trip to Torture Museum. The exhibits are quite interesting and the info texts add some interesting context to them, but on some of the exhibits it would have been interesting to have a more detailed explanation as to how it was used and what the method "did". I liked that they often explained for which delicts the method has been used. 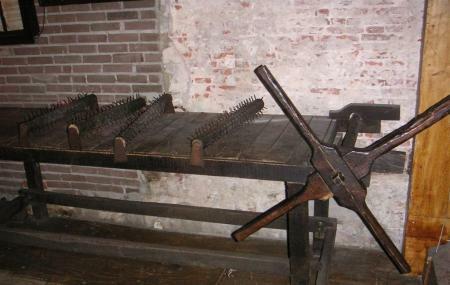 Is a place to know about the medieval methods of torture. From the whip to the guillotine show how we humans on the past make other have a bad time. Some method description lack of further detail for people that would like to have more depth on the topics. Small. There is not a clear explanation about items. It's not worth. I love museums and I wouldn't say it's a museum. There are explanations, but not about "how" they used the items, just "when". Decent and not too much to get in (just under 10 euros) - if you like history and find out out about gruesome ways people to used to torture people, here's your place! Can get through it in under 30 minutes or quicker if you really sped through - not the largest of museums. I expected it to be a little bigger or with more things inside. I mean it was fairly cheap so I guess you get what you pay for. Still interesting though, an experience.